In the middle of summer, I used to think, "Only 5 months until I can ski!" 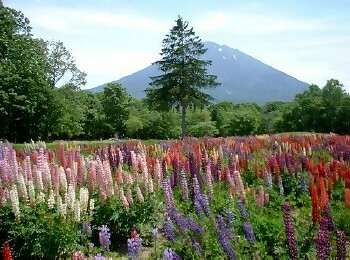 Now that snow is falling in Niseko and thoughts are firmly on winter, summer feels like another world. I love winter and I love skiing but this is a "thank you", to summer gone, to the crisp curl of barbecued beef and beer at night in a t-shirt, summer in Niseko. Mid June, hot day, need work. Call from a friend and three of us are off to peel logs. Overalls, a quick lesson on the two-handled knife and away we go. Not too bad. First you drag the knife over the bark to expose the bare wood below. Next, you get the electric planer and tidy it up. Hard on your arms, back and sun burnt skin, but there is always the chainsaw. Manabu san shows us how to slice the damaged areas away with a few deft strokes. I have a go and the teeth rip and tear through the wood, digging a hole in the log. I try again and make the hole bigger. Try again later. 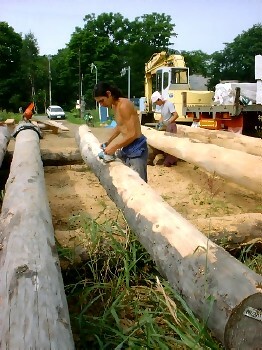 A local log house builder wants us to peel the 70 Spruce logs he has imported from Canada and Alaska. Tanimura san, my new boss, loves all things Australian. For the next two months he greets me by saying "G’day mate, howz it goin?". The logs are about 7 metres long, and thick, weighing 300 kgs each on average. We use a ganta to swivel them on their stoppers. Tanimura can manage two a day. At the start we can do about a third of one in a day, and it still doesn’t look good. Arms are hurting and the sun is hot, and the bark stubborn. The chainsaw make sit all worth it though. A few logs down and you start to sculpt away the damage, leaving it without blemish. You also get to cover yourself in wood chips and smell like petrol, a real days work under your belt. The first log takes a day or two and you finish, roll it away and set up the next one. Back to the knife. At the end of two months we managed two a day, roughly, and we sit on the bosses porch and share a beer. We look back at our first logs somewhat embarrassed but ultimately proud. The logs are carved up and turned into four majestic log cottages just behind Seicomart. My second log was stubborn. Covered in knots or fushi as they are called, Tanimura wanted it to stand out so I had to sand back the knots, like Fuji san, he said. 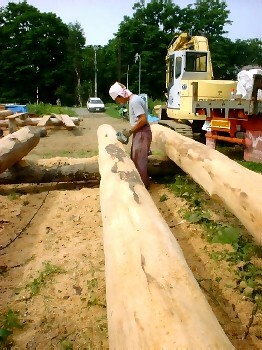 I walk past the cottages everyday and see that log across the top – kusofushi. Ever played golf in Japan? You have to love it. My first round this year was looking very good after nine holes. As I attempted to make the green in two on a par five, Nakamura san said, "nice shot, da ne!" Three wood slices the ball into the forest, chasing squirrels. Do that back home in Scotland and your playing partners beat you with their drivers and throw your body in a pond. Golf in Japan is an experience and golf in Niseko is great. There are a number of great courses, that offer fantastic views and they are cheap. The Tokyu resort runs the Tokyu Golf Course, located just next to Hanazono resort. For the bleary eyed there is the early tee off option.4am. Very good fun but you are shattered by 3pm. I played with Mr. Yamamoto from Pension Log Log. An excellent golfer, he speaks good English and doesn’t cheat. The cost of the round is 3000 yen and you have the course to yourself (well, it is three in the morning). Most of the pension owners are keen to learn English, so they pay for my round on the condition that I speak only English for eighteen holes. The furious scribble of pens is not onto scorecards but into notebooks. Once or twice I was asked," What is ‘bloody hell’?". It’s sometimes difficult to curb your tongue after a bad shot. Hokkaido is different to the rest of Japan in that they don’t stop for lunch after nine holes. You play the full eighteen holes and then in for beers. I once played golf in Hiroshima where there was an "all-you-can-drink" nomihodai after nine holes. Interesting back nine. I can’t say my golf improved much, but I can now play golf with a full orchestra playing in my ear, great concentration. I was also about twenty years younger than my playing partners, and had the best eyesight. I was often the ball spotter. I played almost twice a week, and rarely paid for my own round. Eikaiwa golf! 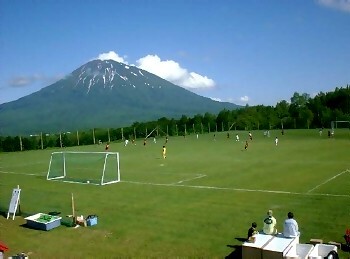 A few years ago, some of the local pension owners in Hirafu formed the sakka kyoukai or Soccer Committee in order to bring soccer teams to Niseko in summer to stay in their pensions. Armed with excavators, chainsaws and manpower, they cut a level surface in the side of a mountain and created the soccer village, four fantastic grass pitches and a wee shop. Teams from all over Japan come for tournaments ranging from elementary kids to adults. The pension owners take care of transport and lodging and the committee makes sure they have balls and half time oolongcha. I made my soccer village debut playing for the Kutchan town hall team. In true Scottish style, I had nailed the keeper twice within a couple of minutes and decided I should calm down. I did learn not to be so colourful when arguing with the ref in English – he had lived in America for a few years. After the game he said, " No, I am not blind." Oops. The view from the soccer village is spectacular. The first thing that struck me about summer in Niseko is how green it all is. The soccer village is surrounded by a myriad of trees and plant life. Nothing for miles, except the town of Kutchan itself, in the distance. The air is clean; there is no noise and acres of space to hold tournaments for as many as twenty teams. Mount Yotei sits across the horizon. On a clear day it is a great place to get a team photo. Summer in Niseko is fantastic. If you want to mountain bike, raft, climb, it’s all here. Endless trails and rivers, endless fun. This summer, I discovered a side to Niseko I didn’t know existed. Golf for less than 5000 yen – any time of day – a soccer paradise nestled in the mountains, and a place where I could work with chainsaws and logs, under the majestic gaze of Yoteizan. "Only five months until I can use a chainsaw……"